Tripp Lite Mini DisplayPort to DVI Cable Adapter (M/M), 6-ft.
Tripp Lite Mini DisplayPort to DVI Cable Adapter (M/M), 6-ft. Mini DisplayPort to DVI Cable Adapter (M/M), 6-ft.
Tripp Lite's P586-006-DVI, 1.83 m (6-ft.) Mini-Displayport to DVI cable, allows you to connect a computer with Mini-Displayport video out port, to a DVI enabled Monitor. 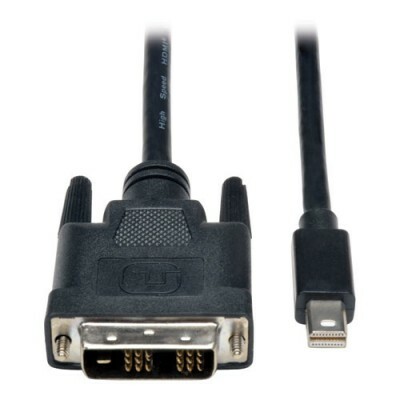 It features a low profile DVI connector that fits neatly into the available monitor space, without jamming between the wall and the back of the display or impeding neighboring connectors. Male to Male design eliminates the need for separate adapter and cable. 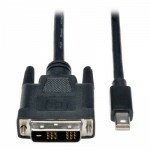 In-line passive adapter is designed for use with Dual Mode ( DP++) Displayport graphics cards. Supports 1920 x 1200 resolution, as well as HDTV 1080P .